These are our most popular replacement blades for hand saws or pole saws. 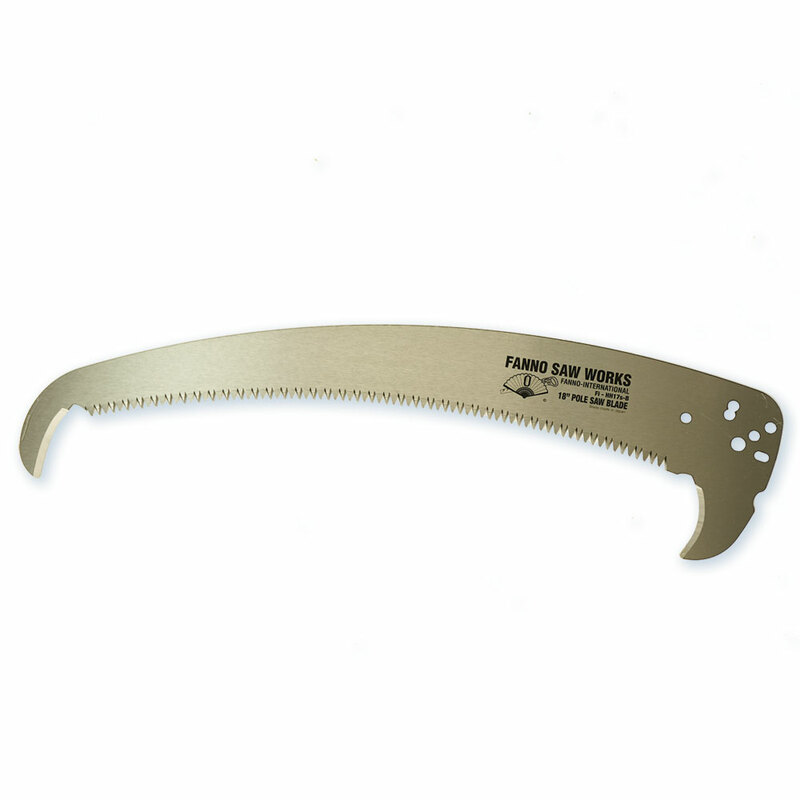 Silky Saw replacement blades can be found next to the appropriate saw on the Silky Hand Saw or Silky Pole Saw pages. Samurai Saw replacement blades can be found on the Samurai Saws page. Additionally, some of the Samurai saw blades which make excellent pole saw blades can be found below. Samurai Saw blades make excellent, fast-cutting pole saw blades. The Ichiban is a premium saw blade series that cuts faster than the heavy-duty series. 15.75” heavy-duty (HD) saw blades are now offered in two different styles: HD (hand), which will fit hand saws and pole saws; and HD (pole), which will fit a pole saw. 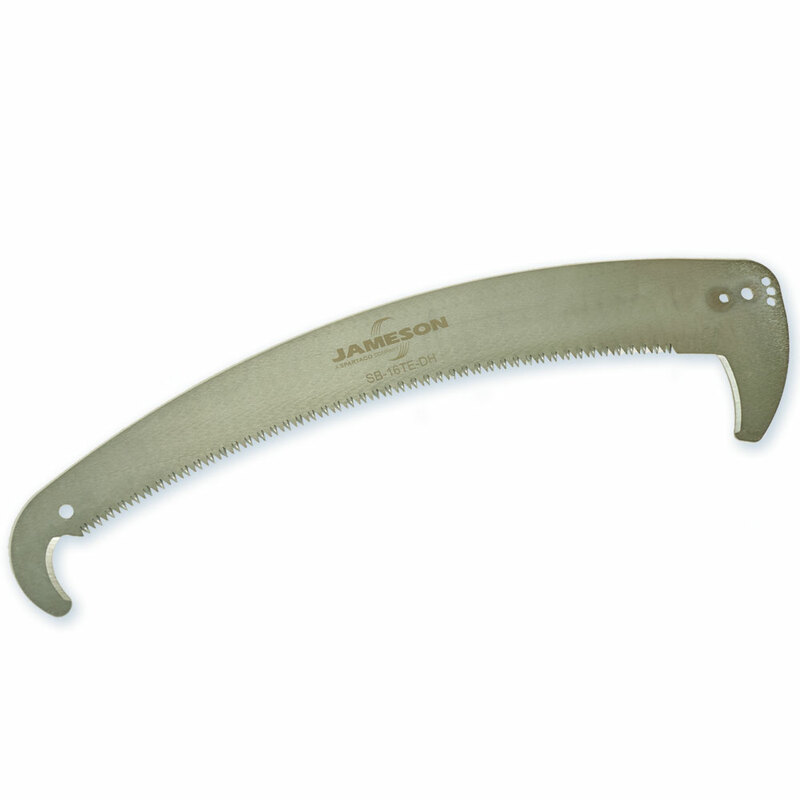 Additional Samurai Hand Saw replacement blades can be found on the Samurai Saws page. 17” Fanno Double-Hook Pole Saw Blade New in 2019! 17" Fanno blade with hook and blade at base. The hooked tip keeps the blade from slipping out of cut and is great for popping through suckers or pulling vines. Score the branch your cutting with the lower blade to prevent the bark tearing and damaging the branch collar. 5.50 large teeth per inch in Fanno's tri-Edge pattern make quick work of wood. This pole saw blade has a universal mount that will fit Fanno, Jameson, & Marvin pole saw heads, plus, you can even use it as a replacement for your Silky Hayate or Hayauchi! Non-hardened blade so it is possible to resharpen. This blade is robust and will cut through limbs quickly, thanks to the extra length and aggressive tooth. **Note that Fanno changed the way they measure the blade in 2013 to measure the cutting edge only. The 14" blade is what used to be called the 15", and the 15" blade is what used to be called the 17" extra-thick. Same blades, different measurements! Fanno saw blades are dependable, fast-cutting blades, many of which utilize Tri-Edge technology. The 13”blade is standard for hand saws and pole saws, and is available with a hooked tip for pole saws. The 15” blade has gullets space along it's length to prevent material from binding in the cut. The 17” blade is sometimes called a “Mondo” blade, as it is extra-thick and strong. 16” Jameson Double-Hook Pole Saw Blade New in 2019! Expanding the Barracuda™ tri-cut blade line, the 16" double hook version is designed for larger branches. Fits Jameson pole saw heads. Does not fit hand saw handles. Sharpened upper hook prevents pulling out of cut and quickly removes suckers or vines. Sharpened lower hook scores bark to prevent ripping damage to branch collar. Tri-cut edge provides a quicker, cleaner cut with less wear on the blade than traditional blades. Hard-chrome plated with impulse hardened teeth for long life. Tri-Edge blades provide a cleaner cut with less wear on the blade than traditional single edge blades. Jameson's tri-Edge blades are hard-chrome plated with impulse hardened teeth for increased wear resistance. 13” Razor-Tooth saw blade from Corona Clipper Co.